Obituary for Khampheng Seangmany | Esterdahl Mortuary and Crematory, Ltd.
Khampheng Seangmany, 81, of East Moline, passed away Sunday, February 10, 2019, at his home. Funeral services will be held at 2 p.m. Saturday, February 16, 2019, at Esterdahl Mortuary & Crematory, Ltd., 6601 38th Avenue, Moline. Visitation will be from 5 to 8 p.m. Friday, February 15, 2019, at the funeral home. Per his wishes, cremation rites will follow the services. Memorials may be made to the family. Khampheng was born on August 3, 1937, in Champasak, Laos. 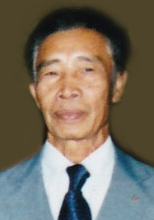 He married Vaeng Sayarath in 1954, in Sanakham, Laos. She preceded him in death on April 26, 2016. He previously worked as a police officer, retiring in 1975. He enjoyed being outdoors, fishing, camping, hunting, gardening and traveling. He also loved to spend time with his family and friends. Survivors include his daughters, Kesone (Sompasong) Onelangsy, Naly Seangrasmy, Amphone (Steve) Boyer, Inpheng (Souk) Kongkousonh; sons, Sak (Senglao) Seangmany and Sombat (Crissy) Seangmany; grandchildren, Tony, David, Bobby (Rosa), Alisia, Sonny, Eric, Vien (David), Vanh, Austin, Dylan, Asia, Alexi & Kashton; great grandchildren, Jonathon, Alyssa, Carson, Matthew, Christopher, Isabella and Emerson; nephews, Lucky Sayarath and Nouphone Vongmathep. Above all, Khampheng was a loving and caring father, grandfather, and friend. He was preceded in death by his wife, parents, and siblings.